No matter what part of the world you are in crashes resulting from driver error and self induced fire are two of the leading causes of supercar destruction. 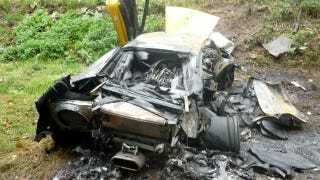 It appears to be a combination of both that ended the life of this Lamborghini Murcielago LP640. According to EnglishRussia where we found these amazing crash pictures, the operator of this Lamborghini was driving at a high rate of speed on the roads near Nizhny Novgorod in Russia when they lost control of the car. The Lambo collided with a Chevy Aveo before ending up in a ditch where it then proceeded to burn itself to a crisp. Amazingly the two passengers of the Murcielago survived the crash and resulting fire. The Lamborghini itself was obviously not so lucky.